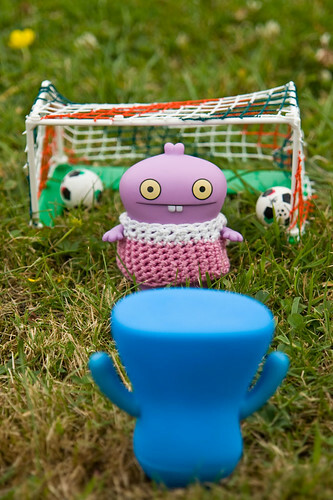 Uglyworld #637 - Babo Struggles With The Goalkeeping Concept, originally uploaded by www.bazpics.com. With Germany set to play against Spain in the 2nd Semi-Final of this years World Cup, football fever has once again taken over my photographs of the little guys. It was almost comical to watch Babo standing in the goal while Wedgehead slammed ball after ball past her into the net behind. Babo called for a timeout to ask, "Why does you keeps hitting alls of them to me really hards?". Wedgie explained, "Is hows footballs is playeds, I musts get more balls into your goal than you cans into mines!". Hopefully Babo understood the concept now and gets better...we'll see as she left me with the parting comment, "I needs some minutes to mentally prepares myself, I will be backs soon! ".